Sandwich That Bought Great Luck! A Florida woman put the sandwich up for sale, saying it has brought her great luck since she found it 10 years ago. eBay originally withdrew the item, suspecting it might be a joke. But it has now apparently been reassured that the offering is genuine. 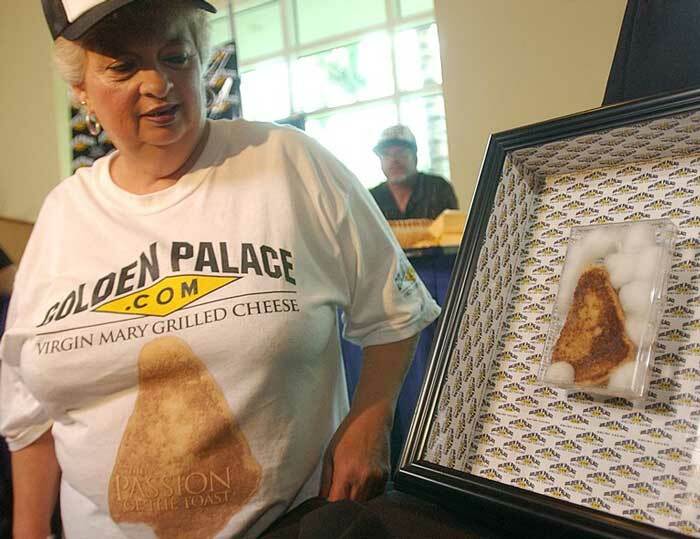 The snack has attracted a bid - thought to be a hoax - of $99.9m. Diana Duyser, 52, of Hollywood, Florida, set a starting price of $3,000, and pleaded with people not to post hoax bids. She described how she came across the mysterious morsel. "I made this sandwich 10 years ago. When I took a bite out of it, I saw a face looking up at me - it was Virgin Mary starring (sic) back at me. I was in total shock," she explained. Mrs Duyser has since kept the toastie surrounded by cotton wool, in a plastic container on a stand. She says a decade on from its conception, it has not shown any sign of mould or crumbling - which she considers "a miracle".